As Colleen and David’s Facebook invitation says: â€œWhether you’re gay, straight or only have love for your cats, we can all say â€œBoo!â€ to that.â€ So they’re pushing back their sleeves, reaching for their rolling pins, and preparing for a long weekend — of baking. Bringing together like-minded folks over sweets and coffee, chatting up the politics in a neighborly way (no speechifying, she promises), promoting tolerance, and reviving the art of flaky crust are all part of Colleen’s vision of community. It’s not a surprising combination coming from a small-town girl transplanted to San Francisco. As for the stars of the party, the pies themselves, Colleen and David will receive fruit donated from local farmers market vendors. Strawberry and stone fruits are good bets for the line-up. They’ll be baking them up at La Cocina’s incubator kitchen, where Colleen works regularly as a volunteer. 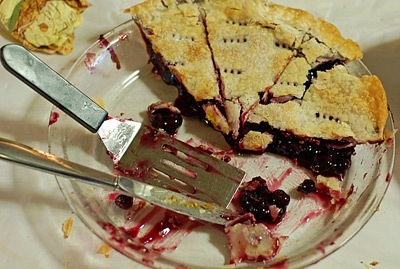 A Midwesterner raised by pie-lovers, I couldn’t resist asking her about her philosophy of crust. Although she appreciates the power of lard, she prefers an all-butter crust for both flavor and wider enjoyment. I’m a part-lard gal myself but certainly can’t argue with the powers of deliciousness and friendliness. We both agree, however, that making pie is nowhere near as difficult or scary as many think. Other lost arts — such as putting up jam — are also on Colleen’s revival list. You can read about her seasonal jam-making sessions at Delights and Prejudices. 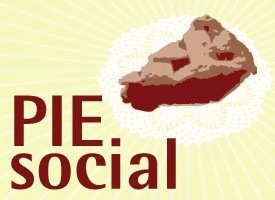 Stop by the Pie Social to meet Colleen and to ask her yourself about the art and politics of pie.